I have hunted high and low to find out what the marks on the ring I have are. As I understand the left is the gold quality, the middle I am not sure about and the right is the date. On this ring it appears as a strange symbol on the left, a bird in the middle and some sort of scythe/sickle on the right. If you could help me identify these I would be very grateful. Hi, The mark on the left appears to be the purity mark for Cairo, this mark indicates the purity at 875-1000 their highest standard, I believe this mark was introduced in 1916 and is still used till the present day, sorry I cannot help with the other marks, regards Trev. One out of three looks like it has been solve can anyone help with the others ? Trev is correct in that the marks are after 1916 and that the mark is probably Cairo but may be Beni Souef but the worn punch takes the detail out enough that one cannot be 100% positive, but the mark on the is not an 18k mark but a 12k mark. 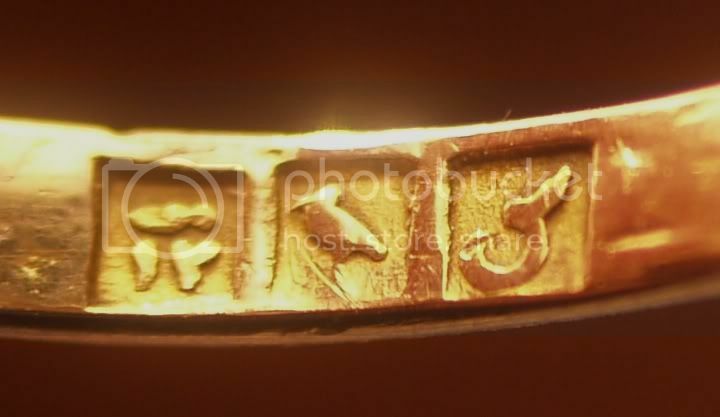 The Arabic characters, the number is read as a 1 and a 2, making it 12 carat. The hightest standard is 23 carat in Egypt, the lowest is 12 carat. The center figure is the Ibis, the iconic bird for Egypt. It's stamp represents gold. Presently, the lotus palm is used for silver. The third is a date character that I can only tell you that the use of the Arabic character was started in 1946. 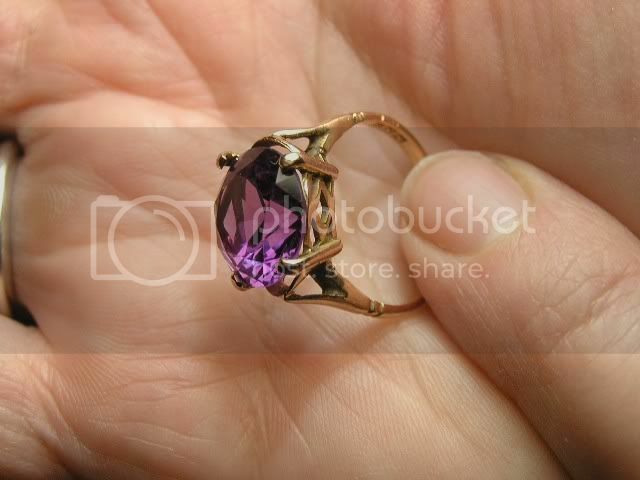 In essence, your ring is 12k gold, made in Cario or Beni Souef after 1946. I was gleaning my information from a German book, ( I am not a German speaker! ), I shall have to invest in a copy of Tardy's, thanks for the correction, thats the great thing about silver and gold hallmarks ,theres allways something new to learn. 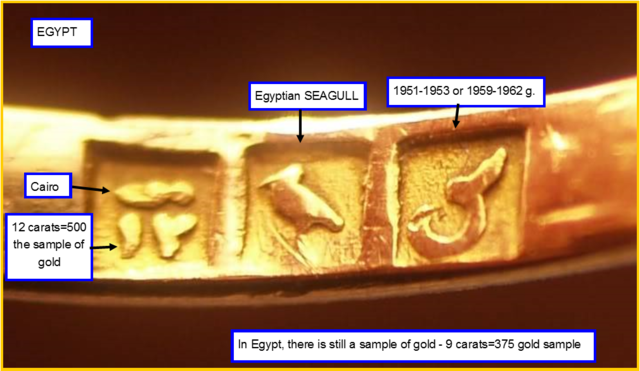 Re: Possible Egyptian Marks on gold ring? Need help identifying. One prong needs to be pushed back over the stone. Use small pliers or ask a jeweler to do it. Otherwise you may lose the stone. I was just given a ring very close to this one, same markings too. How could I post a pic? Hi Aleks, very clear explanation, thank you very much for your contribution.